BAKERSFIELD, Calif. /California Newswire/ — California-based Mojo Sports, makers of interactive sports and entertainment equipment, announced today that their flagship product, the Mojo Pitching Cage, is the "Official Pitching Cage of The Million Dollar Arm Pitching Contest" featured in the movie "The Million Dollar Arm" which opened nationwide in Theaters this past weekend. "The Million Dollar Arm" is based on a true story about a sports agent who sets out to find a successful cricket pitcher in India who can be trained to be a star in Major League Baseball. In a desperate move to find undiscovered talent, he launches a pitching competition throughout India. The Mojo Pitching Cage(TM) is featured in the competition throughout the film and provides movie-goers with fast ball exhilaration that underpins a great underdog sports story. "Over the past several years we've seen everyday athletes pitch at amazing speeds using our pitching cage," says Joe Lewis, inventor of the Mojo Pitching Cage. "So we are proud to be an integral part of this movie and continue to do our part to increase excitement and awareness of great unknown pitching talent around the world." Joe Lewis, owner and operator of MoJo Sports, played professional baseball for six years before he invented the MoJo Pitching Cage in 2000 while working for ESPN. It is currently installed in 21 baseball stadiums across the U.S., including for the Kansas City Royals, Oakland A's, Seattle Mariners, and many other major and minor league ball parks. "We're looking ahead to the 2015 spring season when we will visit 15 to 20 minor league baseball stadiums across the country searching for the best pitcher in the USA," says Lewis. "Contestants will pitch and compete to star on a national reality TV show dubbed 'The American Arm.' The national winner will receive a grand prize and a chance to sign a professional baseball contract." Mojo Sports is the developer of the Mojo Pitching Cage(TM), the world's first pitching cage. Former professional baseball player, Joe Lewis, invented the cage while working at ESPN. 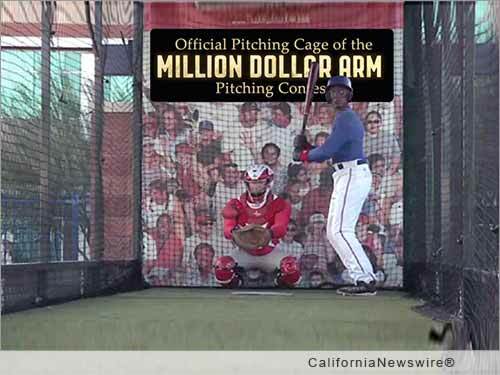 Since then, the Mojo Pitching Cage has been installed in 21 baseball stadiums across the U.S. and is featured in the movie "The Million Dollar Arm." For more info. visit http://www.MojoPitchingCage.com/ or http://www.TheAmericanArm.com/ .